Night – the RAF massively Raided Saarbrücken on 5th October 1944, in order to destroy Supply Lines, especially the Railway. 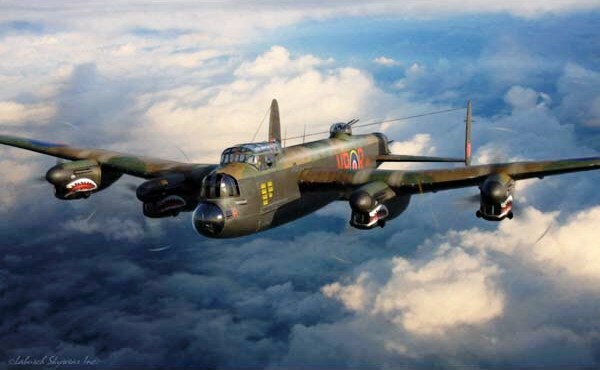 The 531 Lancasters & 20 Mosquitos achieved these Goals, losing 3 Lancasters but destroying large parts of Malstatt and nearly all of Alt-Saarbrücken. From 13th to 14th January the RAF Raided Saarbrücken 3 times, Targeting the Railway Yard. The Attacks with 158, 274, & 134 Planes, respectively, were very effective. A Daylight Operation to Bomb the Hibernia AG Synthetic Oil Plant at Scholven-Buer. Another Operation was being carried out at the same time on the plant at Sterkrade. The weather was very clear and reports state that the Bombing proved accurate although we have no details of the damage/losses on the Ground. 10 Aircraft were lost on these 2 raids. Three-quarters of Gelsenkirchen was destroyed and many above-ground Air Raid Shelters such as at Hans-Sachs-Haus Downtown and the Town Hall in Buer are still in nearly original form. This Large Daylight Raid had, as its Aiming Point, the Nordstern Synthetic-Oil Plant. Gelsenkirchen was reputed to be the most strongly defended area in the Ruhr Valley. Defences consist of Heavy & Very Accurate visually predicted Flak. Not only was it an Industrial Town but nearby lay a Synthetic Oil Facility, creating Fuel Oil from Coal. Air Warfare Strategists had argued that these Synthetic Oil Plants should be the very Top Priority. Post War analysis suggested that their comprehensive destruction across Germany, beyond the very considerable levels of damage that were achieved by the Bombing that did take place, might well have hastened the end of the War. Gelsenkirchen:- The centre of the Synthetic Oil Industry. Population 332,000. Residential Area devastated and the Oil Plants severely damaged. This was one of the most heavily defended places in Germany. Another Synthetic Oil Plant with severe damage and Bomb Craters surrounding it for miles. 07 October 1944 – Emmerich Lancaster Vl JB675 MG-O Longstop Master Bomber (MB – W/C Foster) Town wiped out. The Lancaster just behind us was hit by Flak and we could see the Crew bailing out. We had no sooner opened our Bomb Bay Doors than we had a direct hit by Flak. We dropped our Bombs and headed home, with the Plane performing well. Back at Base we checked the damage and could see the Bomb Bays holed from the inside to the outside. We were lucky as the Bombs protected us from the Flak. The damage was from the Front Turret down the Fuselage to the Rear Turret. The ‘Cookie’ had a thin Casing but withstood the Flak, so we were lucky it did not explode. Even while this message was being Broadcast all Hell broke loose. We fled before the Carpet Bombing, with the Public Sirens of “acute air threat” heard in the open. This air warning automatically turned my stomach, and I always felt painful diarrhoea. I went down the spacious Staircase, sprinting from the 1st Floor, then, with the smashing of windows & doors by the air pressure of the 1st Bombs, along with my 13-year-old sister Hildegard, was thrown on the Ground Floor. In the hail of Bombs and between flying Debris & Flak Shrapnel we got in the Public Air-raid Shelter under the Fire Museum at the Kaiser Street, the 2nd house to the left of the Imperial Road 71. Between them was the house with the practice of Dr Med Kirch Meyer. 738 Aircraft – 383 Halifaxes, 324 Lancasters, 31 Mosquitoes. 3 Lancasters & 2 Halifaxes lost. This large Daylight Raid had, as its Aiming Point, the Nordstern Synthetic Oil Plant. The Attack was not well concentrated but 514 Aircraft were able to Bomb the approximate position of the Oil Plant before smoke obscured the Ground; 187 Aircraft then Bombed the general Town Area of Gelsenkirchen. My sister Genoveva (19) ran with 2 children in a panic to the Church of St Joseph and took refuge in the Crypt there. Under the Fire Brigade Museum we suffered the ultimate Doomsday. Tens of 1,000’s of Explosive & Incendiary bombs rained down on Schalke. All supply lines were interrupted immediately. No water. No power. No Radio Signals or warnings. Someone in the Basement lit a taper, but immediately it went out by Air Blasts. The only orientation offered were some stripes on the walls, which were painted with fluorescent paint. The Bombs were fitted with Rattling & Whistling Air Screws to increase the horror effect among the Civilian Population. By the perfidious acoustics of the descending Carpet-Bombing, we sensed in advance, when and with what weight, a Bomb would hit our Neighbourhood, we ducked instinctively and crouched on the floor. Continually we pressed our fingers in our ears and opened our mouths, so that the tremendous Air Blasts did not tear the Lungs & Eardrums. The Basement swayed & shook. From everywhere came animal screams of agony. Children & women were crying hysterically, cursing & praying loudly, threw themselves on the ground, whimpering, pleading in vain for the mercy of an invisible God. We were Prisoners in Hell. Smoke, Heat, then an infernal roar & crackle. The building had collapsed on us. Smoke crept in through cracks in the walls and shattered doors. The House collapsed on us and burned like tinder. The heat was unbearable. Through an opening in the back part of the Basement staggered in blackened shapes, covered with wet blankets. One of the fugitives voice choked with tears: “Schalke Street no longer exists.” This was Dante’s “Inferno” pure & simple. There was weeping & gnashing of teeth. The battered people roared & sobbed in despair and fear of death. Horror & shudder came from every joint. After the 1st Assault wave, with 738 Aircraft, abated after an hour, we wanted to leave the Shelter, but above us were burned ruins. The Basement Entrance (staircase) to Emperor Street was half buried by glowing rubble & burning beams, blocking the opening to Schalke Road as an Escape Route, through an infinite sea of flames and was impassable. My mother Mathilde Krause quickly realised the situation and organized the totally desperate, distraught women into a Rescue Party. She grabbed the still burning parts of the planks & beams and quickly threw them sideways away from the Basement entrance. The rest of us managed the smouldering wood further back, to keep the area passable. My mother threw smaller debris in a high arc through gaps in the Barrier upwards to the blazing heat of the fire. So they managed to create a narrow escape Hatch, through which we Survivors crammed with our scorched, smeared clothes and found the way to freedom. That is, to a roaring hurricane of fire & smoke, while above and around us, outstanding Beams fell crashing, burning & glowing down from the rubble. Smouldering pieces of wood rained down. All around blazing Schalke, an infinite shower of sparks was drifting. Mothers cried their despair with the deadly fumes into the Sky. Then our paralysing horror: The Houses on the Street were tipped into huge piles of debris on the road. In the smouldering window openings, gaped ghastly horror. From our House, whose interior was thrown through the perforated façade across half the roadway, struck the blazing flames. Other houses were burning like giant torches. The fire sites produced a terrible undertow as biblical pillars of fire: “The earth was formless & empty,” she was covered with flames. We, a party of crazy desperate people, clung to each other and climbed over the chaos of the burning wreckage towards Schalke Market; because in the opposite direction fiercely burned the Spires of St Joseph, threatening to topple into the street. In the Maelstrom, a fleeing old woman stumbled upon the blazing timbers and lost her hat. She wanted to run after & rush to the rescue of her hat in the flames. I only 12 years old – held her back and instinctively pulled her by the hand away from the fiery storm, and we staggered together over the blazing ruins. On windows on the 1st Floor of this house or next door, a brightly burning woman with raised arms gesticulating wildly and shrill voice in agony, begged in vain for help. The Schalke Market, enclosed by huge torches of fire degenerated into a single chaotic, Nero-Churchill pyre. Near the Restaurant “Bei Mutter Thiemeyer” (of Schalke-04 legend), the old “Imperial Hall”, and in the House next door desperate and completely crazy people – obsessed with naked madness – in the mad hope of being able to save anything, threw pieces of furniture out of the windows of the burning room onto the sidewalk, where they crashed. The Gewerkenstrasse only consisted of huge, brightly burning or smouldering rubble heaps, which were thrown from all sides criss-crossing each other: Apocalyptic mountains under the deadly Sun of Satan. Again & again detonated delayed-action Bombs. The air was filled with swirling deadly showers of sparks. The industrial facilities to the North & West of Schalke Market mutated into the Hellfire of Lucifer. Everything burned, crackled & roared, people screaming, shaking bitter and desperate. We found Emergency Shelter in the overcrowded Spitzbunker (“Schalke Sugarloaf”), crammed with bloody people and thick with fumes – in the middle of the Schalke Market, which was covered with Bomb Craters and littered with countless smouldering ruins. My mother immediately went to help work the pump units which by manual operation supplied fresh air for us, otherwise, the occupants were hermetically sealed off from the outside world by the Power Cut. Inside, it was stuffy & overheated. We sat on floors & stairs, crammed in like sardines. The British increased the horror by another, perverse attack wave. So we experienced and survived the 2nd major attack in the evening on the same day, 6th November 1944 at 19:25 o’clock. Death returned. Schalke was the Necropolis, the field of blood, the blast furnace for human flesh. The Evil One again grabbed greedily for us survivors of the earlier disaster. Again the horror returned and cruel destruction was repeated. The “Sugarloaf” was hit twice by Bombs in the evening after the 2nd Alarm. Our misery was multiplied. We shot through. The “Sugarloaf” shook constantly so much that we thought it would topple over. Again crying & desperate people, a bunch of lunatics in fear of death, shaken again within a few hours and harassed, blaring or whining children with full faeces pants without food & water, without electricity, adults who urinated as infants in their underwear. That’s not to surpass the horror that had befallen Schalke. It smelled of burnt flesh & filth. Where the Hell was God on this 6th November 1944? Even today, after more than 60 years, I weep as an old man, when the calendar indicates the 6th of November. We were driven by the inflamed & uninhibited horror & terror, had survived the eruption of hell, volcanoes of phosphorus, attacks of fire accelerants, the mighty blasts of Air Mines, the roar of a 1,000 fires. Late in the evening, a treacherous peace arrived, and before the forces of Order arrived, individual Groups in the Bunker made their way in succession over a still intact Emergency Stairs to the Entrance, to go for “fresh air”. This, however, had ​​a penetrating stench of fire, burning & cooked flesh. Around us, only debris & conflagrations were seen. Some women stood silently in front of endless suffering, some sobbed, others went mad and roared desperately their pain against the brutal, merciless, bloody sky. The people shouted in horror, fell weeping into the arms: Schalke was erased, the district smashed, in the cellars burned stinking corpses or the dying. Buried, like Pauline Hengsbach who – trapped between fallen beams – was cremated alive. Konrad Hengsbach was injured in the ear by phosphorus. It was raining fire from the Sky – as in Egypt of the Old Testament. In phosphorus-spray people were charred & cooked at 1300°C, roasted alive. The unpleasant smell of phosphorus caused nausea. Whenever I smell carbide or garlic, the images of the Phosphorus-burned strike me again. Many had lost their belongings on 6th November 1944, were homeless. God had turned away from Schalke. Our sister Genoveva we thought was dead. Eventually, she came back distraught to us, with the 2 sisters. She had been rescued from the Crypt of St Joseph – the burning Schalke Parish Church. Later, my mother and Mrs Kassner (wife of Dr Med Hans Kassner) found that the Upper House of the Study Director of Adolf Hitler School, despite a hit by an Incendiary Bomb, offered temporary accommodation. So we lived there. Only 3 or 4 days after the 2 major attacks on 6th November 1944 Rescue Teams entered the Basement of the collapsed Drugstore Schmitz (Kaiser Street corner & Grillo Street, left 2 houses from the Fire Brigade Museum) and brought out a woman. She lay in front of the ruined house and was totally black, burnt, charred, sooty, her face unrecognisable: But I noticed, as I bent over her, that she – stinking of burnt flesh & faeces – still breathed weakly. Where roads were paved, you could not go, because the tar was swollen by the heat of the fires to a viscous mass. In the Gym of the High School (entry in Schalke Road), which was only partially destroyed, the bodies and body parts were collected, burned, shrunken, shredded. 518 Bombing Victims were identified. Later statisticians calculated for that day of horror on the Battlefield of Gelsenkirchen, the dropping of 6460 Bombs & 167,131 Incendiary Bombs. 17,880 houses were Bombed to rubble. A,S/L A J L Craig’s Award of a DSO (441024) was Gazetted on 24 October 1944 (Gazette No.36761 4th Supplement to 20 October 1944) which gives no Citation but Ranks him as an ‘Acting’ Squadron Leader, still of No 7 Squadron. Craig, Alan John Laird, S/L, DFC (103561, RAF) – No.7 Squadron – Enlisted 1940. Commissioned 1941. On 17th October 1944 while on well-deserved leave, Craig received a letter signed from Paul (Adjutant?) at 7 PFF Squadron, Oakington, that a Posting for him had come through transferring him to 3 Group (at Exning). (wef 26th October 1944). 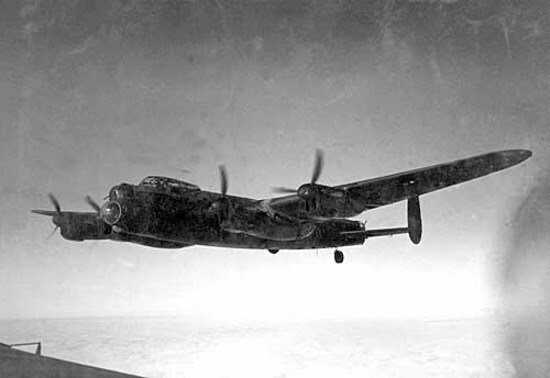 As a result, his Wing Commander rather than letting his Crew continue on Operations without him as Captain would ask the Group Commander to consider them ‘Tour Expired‘. The same letter advised that his Crewman F/O Morrison had been promoted to Flight Lieutenant.